NETWORK Lobby for Catholic Social Justice urges you to vote NO on the motion to proceed for any vote to dismantle the Affordable Care Act and Medicaid. We believe this legislation is misguided and beyond repair, so we urge you to vote no on the motion to proceed. From our faith communities and our travels around the country listening to the needs of people, we know that access to healthcare is a matter of life and death. Any of the GOP proposals would lead to at least 15 million more uninsured by next year and at least 22 million more uninsured within the decade. Many of these new uninsured will be displaced by deep cuts to the Medicaid program, which is an essential source of care for millions of children, seniors, people with disabilities, and people experiencing poverty in our nation. This is far from the Gospel mandate to care for our most vulnerable sisters and brothers. No amendment to add funds or change the per capita cap growth rate will fix the fundamental flaw of the BCRA or other proposals. 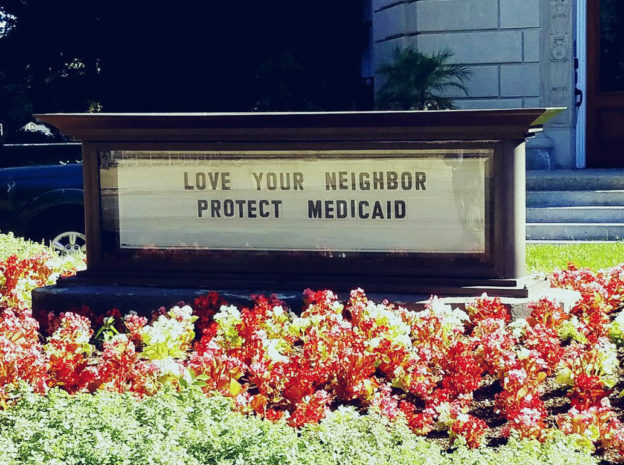 At its core this strategy is a large tax cut that is paid for by deeply cutting Medicaid and other supports, taking from the very people our faith tells us to care for. This bill has lost sight of community and the common good. Our faith teaches that healthcare is a communal good and a right that all must enjoy to live in dignity. We urge you instead to work toward the common good by expanding access to quality, affordable healthcare through an open and bipartisan process. This dangerous legislation is not the faithful way forward and must be prevented from proceeding. We will score it in our 2017 voting record. Stand by Gospel principles and vote NO on the motion to proceed. This entry was posted in Healthcare on July 25, 2017 by laura.